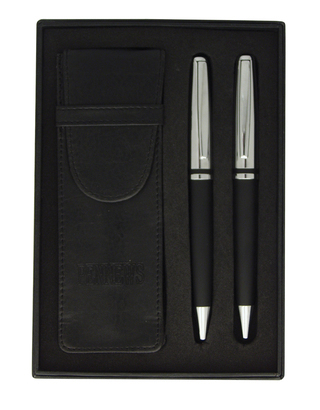 The Midnight Pen Set is an elegant classy choice for your corporate gift promotion - make your impression with the allure of Midnight. Contains P205 black Metal Ballpoint Pen and P245 black Metal Mechanical Pencil with chrome trim. Have these promotional writing instruments printed or laser engraved in gold with your logo to cap or barrel. Ballpoint comes with twist action, retractable ballpoint delivering black ink via a Penline Swiss refill (soft ink, 1.2mm nib, 4,000m capacity). The retractable Mechanical Pencil comes with an 0.7mm tip with HB graphite. Packaged in a P20N matt black cardboard gift box with lift off lid which contains a PU Pouch alongside space for the pen and pencil.